The Wallaby is an informal designation generally used for any macro-pod that is smaller than a kangaroo or wallaroo that has not been designated otherwise. Wallabies are herbivores whose diet consists of a wide range of grasses, vegetables, leaves and other foliage. Smaller species of wallabies live in a wide range of habitats, from desert to woodland to rain-forest. Wallaby belong to the same taxonomic family as kangaroos and sometimes the same genus, but kangaroos are specifically categorised into the six largest species of the family. ⧪ Wallaby or quokka was hunted for meat and fur. 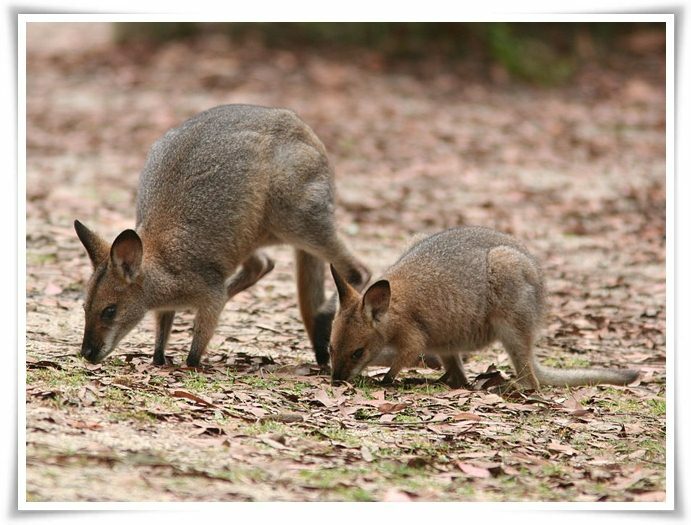 ⧪ Most wallaby species founded are small but some wallaby species can grow up to approximately two meters in length. ⧪ Their powerful hind legs are not only used for bounding at high speeds and jumping great heights, but also to administer vigorous kicks to fend off potential predators.